It's gonna be a short list this quarter. And in this moment, I'm feeling really committed to both projects. In the short-term, my Seattle MQG improv BOM quilt top is the priority. I'm so tickled how some skinny improv spike slabs brought the blocks together in a way I'm really smitten with. I have a tentative plan on how to add a bit more to the top before moving on to quilting. 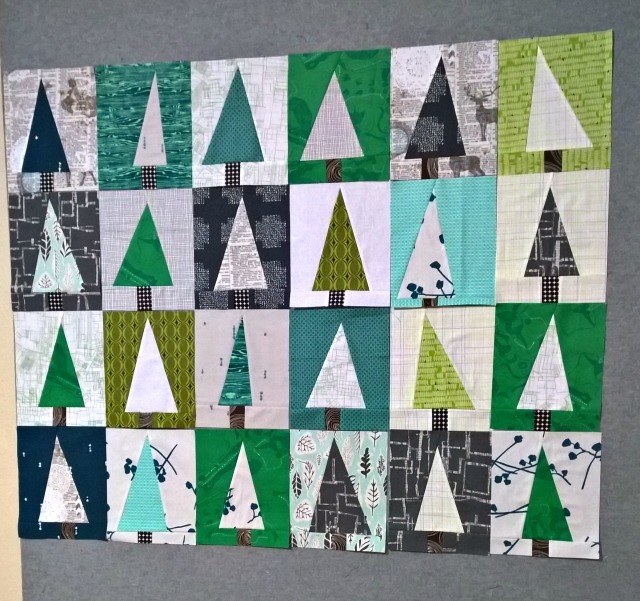 My second work-in-progress is a Patchwork Forest quilt, using the Modern Christmas Tree block tutorial by Amy/Diary of a Quilter. I'm creating it from stash in my own personal favorite Christmas palette. I've got 24 blocks sewn and trimmed, another dozen sewn, and a bunch more cut out - not quite enough but close. 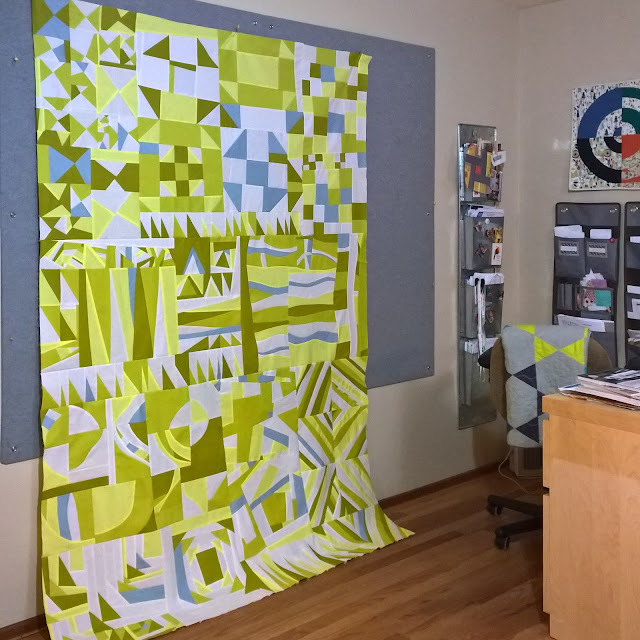 I'd be happy to work on this quilt throughout the quarter, in amongst other projects, so that's the goal. I really only had two other wips - both of which I gave away! One was gifted to a random winner on Instagram - and the other was claimed by daughter dear. How awesome (and freeing!) is that? So I'll stick with the remaining two and hope for the best. Two beautiful projects to work on are better than none. I really like both. The first quilt top still amazes me with the color combo in each of the blocks. You did a beautiful job - as with the second one. Your BOM quilt is spectacular. I'm usually not a fan of 'sampler block' quilts but your variation in block size and simple, consistent color palette really adds interest and movement to the quilt. Nice. Loving your forest! Great project to work on this quarter! Oh, these are both gorgeous WIPs, Debbie! Happy finishing! Wow ! Only two WIPs ... ;-) They are both great ! Good luck Debbie. That top quilt is so interesting . . . I love being wrapped in a quilt that not only keeps me warm, but that gets into my brain and starts my imagination dancing in delight. That one is perfect! Wow! Imagine clearing up those two WIPs and having freedom to start some new things do that you can keep joining FAL this year! Loving the green! Both look like really fun projects tow work on. I think I'm just stunned that you got rid of two projects, but good for you, if you aren't feeling it, then move on! Well I know for sure you will finish the two quilts on your list! Two great projects! I really love the colors in your forest quilt.